As Stephen Colbert signed off for the holiday season on December 15 his fans, no doubt, felt the let-down of upcoming reruns. With the Republican primary in full swing, The Colbert Report has been one of the premier sources of insight into the primary race and Colbert's spin on the political scene will be sorely missed. But fans of Colbert should take heart because even in reruns his show keeps on giving. We have recently watched Colbert defend Christmas. While in character as a Bill O'Reilly-like pundit, he has waged a "Blitzkreig on Grinchitude" and has applauded the idea of a "Gun Filled Christmas." He has also mocked Rick Perry's Pro-Christmas ad where Perry states that "there is something wrong with America when gays can openly serve in the military but kids can't openly celebrate Christmas." But his in-character defense of Christmas is not the gift I have in mind. What is Colbert's greatest gift this holiday season? It's his satire -- and especially his way of using words -- puns, neologisms, wordplays, etc. -- to encourage his audience to think critically. 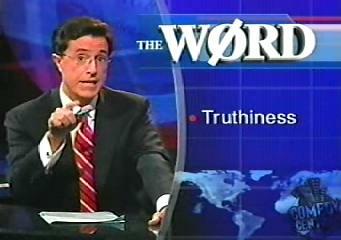 We all remember the incredible impact his neologism "truthiness" had on the public. "Truthiness," the term that he used to open his very first show on "The Wørd" segment, later became the Word of the Year in 2005 for the American Dialect Society and in 2006 by Merriam-Webster. Even more importantly, it became a part of everyday speech. The term was a direct reference to George W. Bush's claim that he learned his truth from his gut. And while many of us were aware of the ways the Bush administration manipulated the truth, Colbert's naming of such practices as "truthiness" gave us all a common vocabulary through which to talk about such practices that was both biting and witty. That was only the beginning. Since his first show one of Colbert's signature elements of his satire has been his smart, witty, playful, and incisive use of words. While there is a range to the ways that he uses words in his comedy, each wordplay works to combine comedy and critique. This past May, he gave us a "The Wørd" segment on "Enhanced rejustification" in reference to arguments that torture led to the death of Bin Laden. The segment deconstructed the rhetoric of pro-torture Republicans, showing the fallacies in their logic and the flaws in their arguments. These are only a few examples of a practice that is at the heart of Colbert's satire. He watches the ways that those in power abuse language -- as in the case with his critiques of politicians, pundits, and members of the mainstream media. But his attention to words is not simply negative critique. He also offers new words and plays on words that expose flaws in the ways that those in power communicate to the public. Since his show aired in 2005 he has offered his audience the gift of a uniquely powerful use of satirical language -- one that allows his audience to reflect on social injustice while also having a laugh. Ask a Colbert fan and they will undoubtedly have a series of favorite Colbertisms. These are words that we have used to identify issues important to us, but they are also words that we remember because of the way that they helped us to feel part of a wider community and because of the fun we had when sharing the word with a friend, relative, or colleague. Colbert's wordplays offer new ways of thinking about pressing social issues. And they're fun. That means they make us smarter and happier. It's a gift that keeps on giving. So while you're waiting for the reruns to pass, consider celebrating a Colbert Lexi-Christmas by sharing a favorite Colbertism with a friend.